You are loosing money by not switching to AMSOIL. You are loosing money on fuel consumption and wear. AMSOIL is about no compromises, saving you time and the most value for your maintenance dollar.The comparison chart1 compares amsoil synthetic 10W30 to other manufacturers. 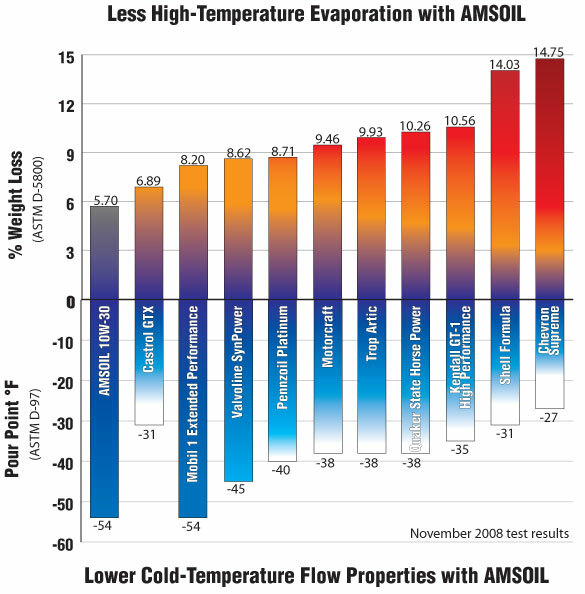 The comparison chart 2 compares amsoil synthetic 5W30 to other manufacturers. You may have noticed that no other manufacturer publishes ASME test data with competitors names and brands listed. Now you understand why amsoil synthetic oil is the best oil for your vehicle. In most cases there are multiple choices for each weight of oil. To get the best oil for you vechicle you decide how often you intend to change and filter your oil. If you look at the index you will see weight and applications listed. There are 3 differend 5W20 oils, 6 different 5w30 oils. There are three different 10W30 oils, they are explained lower down. There is a motor oil comparison chart which compairs ATM with other oils. The 5W40 oil are either on the Diesel page or the Volkswagen page. At the bottom of the page I have the 4 easy steps to changing to better protection and improved gas mileage of synthetic oil. There is a conventional oil vs synthetic oil video here. We call this synthetic 10W30 OET. OET synthetic 10W30 is one of the OE series oils. They are designed to the new 2011 specifications to give you the protection and better gas mileage of synthetic oil without extending your drain intervals. When you are considering the advantage of synthetic oil vs regular oil this is the best motor oil to choose. The OE series oils will give you better economy, higher efficeincy and more protection than reguler oil when you follow the manufacturers oil change intervals . OE series synthetic are available in these additional weights: OEF 5w30 and OEM 5W20. There is a brochure you can read and download here. Here is a you tube video discussing conventional oil vs synthetic oil. Hear if from the experts. You will understand why Amsoil is your best value and performance for your engine and your wallet. AMSOIL XL Extended Drain Synthetic Motor Oils provide better wear control, high- and low-temperature protection and increased fuel economy compared to conventional oils. Formulated with extended-drain boost technology, AMSOIL XL Synthetic Motor Oils provide superior performance for up to 10,000-miles/six months, or longer when recommended in ownerâ€™s manuals or indicated by electronic oil life monitoring systems. GM dexos1 (supersedes LL-A-025, 6094M and 4718M) Fortified with detergents that exceed dexos1 sulfated ash specifications. We call this oil ATM. it is an Amsoil 10w30 100% synthetic oil.This is a Signature Series Synthetic oil. ATM 10W-30 is one ot the A series oils. Amsoil A series were designed to give you the best gas mileage ( lowest four ball test number ) and are our best selling extended drain product. They are available in three weight . ASM 0W20, ASL 5W30, and ATM 10W30. The A series oils are designed for 25,000 mi or less oil changes. To this they are fortified with premium additives. To go to 25,000 mile drain intervals you must also use a nonofiber oil filter rated for 25,000miles or as an alternative change a regular oil filter at its recomended drain intervals. The A series oils are reported to improve your gas mileage. This is the slipperiest product we make, that is confirmed with the Lowest 4 ball wear number, which you can find on the test data. If you would like more informaton about ASTM technical wear data or best pricing,warehouse pickup or same day ship please call 800-692 7109.There are two motor oil comparison charts in this section the first chart compares ATM 10W 30 to Castrol GTX, Mobil 1 Extended Performance, Valvoline SynPower, Pennzoil Platinum, Motor craft, Trop Artic, Quaker State Horse Power, Kendall GT-1 High performance, Shell Formula, Cheveron Supreme. The motor oil comparison shows using ASME test ASTM 5800 that ATM protects your engine best because it evaporates the least. The second chart shows a motor oil comparison comparing ASL 5W30 to Red Line, Mobile 1, Pennzoil Platinum, Mobil Clean 5000, Havoline, Quaker State Horse Power, Valvoline Syn Power. Five of the oils shown evaporate almost twice as much as ASL. This presents a grave danger to your engine. The others evaporate more and usually cost more. The amsoil A series extended drain oils provide the best value and performance for your vehicle. They are the lowest cost synthetic oil per mile on the market today. I have more motor oil comparison tests comparing Amsoil ATM synthetic 10W30 vs Valvoline SynPower, Castrol GTX, Pennzoil Platinum, Quaker State Horse Power, Mobil 1 Extended Performance, Shell Formula, chevron Supreme, Kendal GT-1 high Performance, Motorcraft, Trop Artic. In my mind this is the most important test. I spun the connecting rod bearings in my honda prelude and my toyota celica while they were supposed to be protected by Mobil 1.You can clearly see that Mobil 1 doesn't provide the best protection. This could happen in traffic, towing a trailer, driving up a steep grade or just taking a long trip. 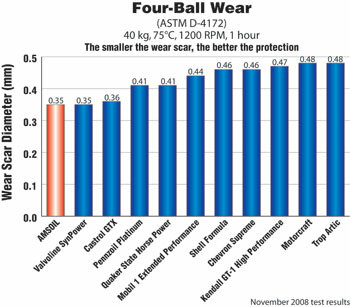 Amsoil ATM synthetic 10w30 Protects Against Wear Four-Ball Wear - ASTM D-4172 The Four-Ball Wear Test evaluates the protection provided by engine oil under conditions of pressure and sliding motion. The size of the scar left as a result of the test determines the amount of wear protection the lubricant provides. The smaller the wear scar, the better the protection. 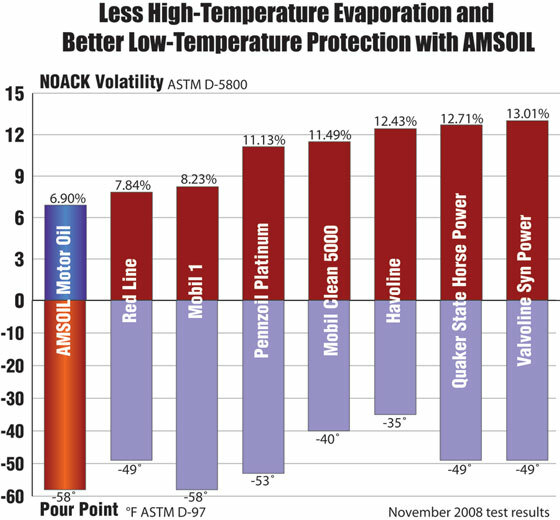 Tests show that AMSOIL 10W-30 Synthetic Motor Oil has better antiwear performance than all other oils tested. With AMSOIL Synthetic Motor Oil, engine life can be extended and major repairs are often reduced. This motor oil comparison test compares Amsoil synthetic 10W30 to Valvoline SynPower, Castrol GTX, Pennzoil Platinum, Quaker State Horse Power, Mobil 1 Extended Performance, Shell Formula, chevron Supreme, Kendal GT-1 high Performance, Motorcraft, Trop Artic. AmsOil ATM synthetic 10W30 Helps Engines Start Easier. The test : Cold Cranking Viscosity - ASTM D-5293 The Cold Cranking Test determines the apparent viscosity of lubricants at low temperatures and high shear rates. Viscosity of lubricants under these conditions is directly related to engine cranking and startability. The lower a lubricantâ€™s cold crank viscosity, the easier an engine will turn over in cold temperatures. The low cold crank viscosity of AMSOIL Synthetic 10W-30 Motor Oil reduces drag on moving engine parts and allows engines to achieve critical cranking speed in extremely frigid temperatures. Engines turn over quickly and dependably in the coldest winter temperatures. Every morning when you start your engine it is cold. There is just more protection with AMSOIL. 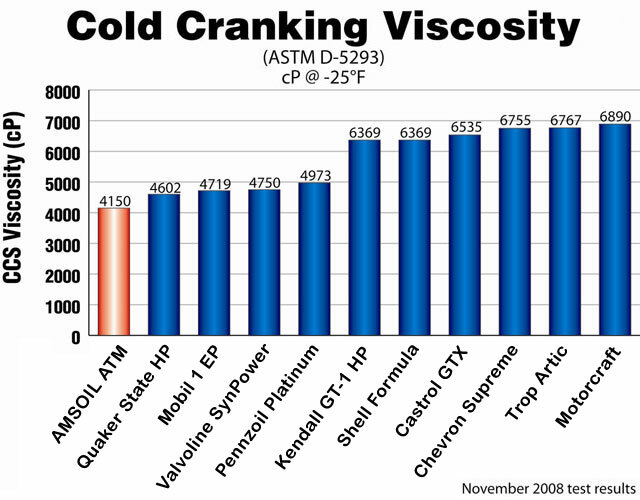 This motor oil comparison test ( ASTM d-5293 ) shows the cold cranking viscosity of AmsOil ATM synthetic 10W30 vs Valvoline SynPower, Castrol GTX, Pennzoil Platinum, Quaker State Horse Power, Mobil 1 Extended Performance, Shell Formula, chevron Supreme, Kendal GT-1 high Performance, Motorcraft, Trop Artic. 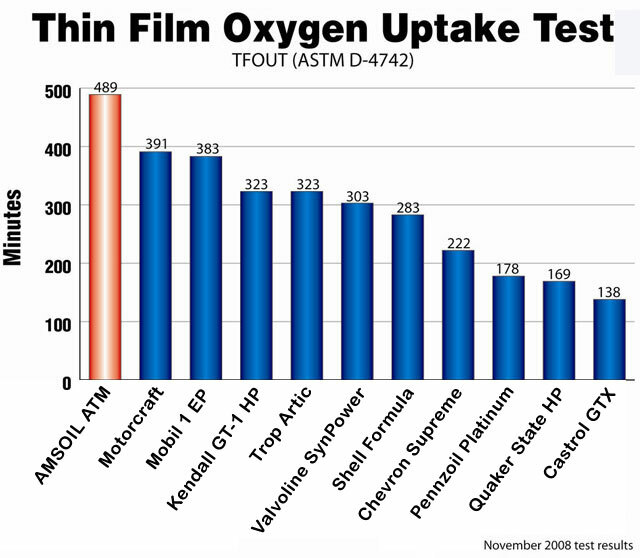 AMSOIL ATM synthetic 10W30 Extends Oil Life Thin Film Oxygen Uptake Test - ASTM D-4742 . You have heard about engine sludge. This test will show you which oil will produce the most sludge. The Thin Film Oxygen Uptake Test (TFOUT) is used to evaluate engine oilâ€™s ability to resist heat and oxygen breakdown when contaminated with oxidized/nitrated fuel, water, and soluble metals such as lead, copper, iron, manganese and silicon. This test is designed to mimic the operating conditions of a gasoline engine. AMSOIL 10W-30 Synthetic Motor Oil has superior heat and oxidation resistance to control sludge deposits and extend oil life. Engines stay clean for maximum protection and oil changes are reduced, saving time and money. This motor oil comparison test compares AmsOil ATM synthetic 10W30 vs vs Valvoline SynPower, Castrol GTX, Pennzoil Platinum, Quaker State Horse Power, Mobil 1 Extended Performance, Shell Formula, chevron Supreme, Kendal GT-1 high Performance, Motorcraft, Trop Artic. This will be very noticeable when you pull out your dip stick and your oil is cleaner then ever before.